Technological advancements are constantly moving us forward in every aspect of our lives. One of the most fascinating forms of advancement is the way we cook. The newest trend in cooking is the induction hob. They can be found everywhere, and they’re getting a lot of press. If you’ve been thinking about a induction hobs vs gas hob, or instead of an electric one, here are some things you should know. How Does The Induction Hob Work? Induction heating is different than other forms of cooking. Gas stoves, of course, create flames that heat pots and pans. Electric stoves as well. An induction hob, on the other hand, use a copper wire with alternating electric currents. This makes an oscillating magnetic field, which heats only the pot, and not the surrounding area. You can literally set your hand on the stove top, and feel no heat. An electric stove, of course, is not something you want to touch. An induction hob heats up very quickly. A pot of water can be boiled faster than on an electric stove. They can also be set for specific heats, unlike any heating form that’s come before it. And they have greater consistency of heat, keeping the entire pan surface at the same temperature. If you’re thinking about an induction hob, though, keep in mind that not all pots can be used with them. If you’re a fan of glass, ceramics, copper or aluminum pots and pans, this might not be the right hob for you, as none of these things will heat on it. All pots also have to have an entirely flat surface, which in most cases will rule out woks. They do make special woks for induction cooking, but they can be hard to find and expensive. If this is a concern for you, you want to stay with your electric hob, since there are no material limitations. The induction hob is safer when it comes to little hands and paper. You can literally set a whole roll of paper towels right on top of the stove with no negative effects. This is not to be suggested with an electric stove. On the other hand, aluminum foil will melt on the top of an induction stove, ruining it for good. Cleaning though, is far easier with an induction hob. Most things that take so long to scrub off a traditional stove have burnt onto the surface, or had time to stick because the stove top was too hot to wipe down. With an induction hob, you can wipe the whole thing down right after cooking a meal without risking a bad burn. Like any new technology, induction hobs are something to research before investing money in. While there are a lot of benefits, you should consider your own cooking style and whether this is the right tool for you. 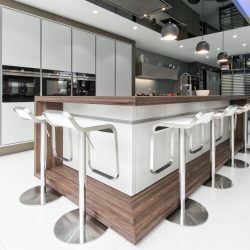 Induction Hobs vs Gas Hob? Gas hobs burn gas to generate heat, which then passes through conduction heating into the pan or other object that is within the influence of the heat. This is conductive heating and works by putting energy from the burning gas into its surroundings which then transfer heat to their surroundings. An example would be asparagus in a pan, on a gas burner. The burner heats the pan and the air around it, and then the pan heats the asparagus. The brand Hotpoint currently offers a stainless steel, four burner gas hob. Many other brands are available. Induction hobs heat the pans by induction, and thereby require special types of pans. Metals that do not conduct electricity will not function with an induction hob. So this is a potential drawback. One advantage is that the cooktop itself does not generate heat. This may make it safer, however that is questionable because the pans they heat are still hot and can burn you or anyone else just the same as if it were a gas hob. Gas hobs work with any kind of pan that you have regardless of whether it conducts electricity, but open flames are generally regarded as dangerous. If you choose to cook with open flame you should be careful with it, and exercise a high level of caution. Be careful that neither you nor anyone who may be in your house burn themselves or set fire to anything. Some hobs work through the process of induction. Induction heating takes place when conductive metals, like iron, are exposed to a changing magnetic field. An electrical current usually generates the magnetic field, and then it is altered by either changes in the amount of power supplied to the electromagnet, or by the relative motion between a magnet and a nearby conductor. These changes in the magnetic field produce eddy currents. These are electrical currents that swirl inside the element that is under the influence of the changing magnetic field. These currents encounter resistance in their swirling, and this process generates heat. In induction heating, only the conductive metal that is exposed to the changing current is heated by the process. 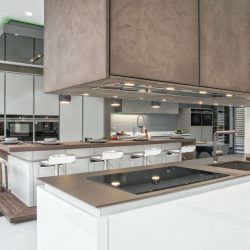 However, it is important to remember that once heated, the metal will heat its surroundings by traditional conduction heating, and this includes your beautiful worktops too!. Induction hobs work by taking advantage of this process of induction heating. It requires the use of a conductive pan, and the application of the changing magnetic current. The pan becomes hot and heats its contents by conduction heating. The brand Neff currently offers a sleek black glass covered induction hob.